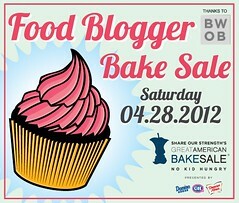 This Saturday is the 3rd annual Food Blogger Bake Sale and I am so excited to be participating for my first time! Each year, Share Our Strength hosts the Great American Bake Sale, among other events, to raise money in an effort to end childhood hunger in America. Their premise is simple: No Child In America Should Go Hungry. The goal is to end childhood hunger by 2015. Take the pledge to end childhood hunger, volunteer at a fundraising event, or go buy stuff from one! Where ever you are in the United States you probably have a bake sale happening in your area this Saturday, April 28th. I will be baking for, and volunteering at, the one in Los Angeles at BLD Restaurant. Click on the Bake Sale icon above, or any link in this post for more information on where you can go obtain some yummy homemade goodies this weekend as well as more ways you can get involved in this great cause. These muffins are moist from the absurd amount of mashed banana I used, and they contain no egg or dairy! I first made them with honey in an attempt to get away from processed sugar, but then I read something on an Ayurvedic website about heated honey being poison. I have not researched enough to form a clear opinion on that, but decided a small amount of white sugar in my muffins wouldn’t be the end of the world. Also, you can easily substitute your favorite alternative sweetener for the sugar. Bonus to using a sweetener that isn’t honey: these muffins are vegan! (Make sure to use chocolate that is also vegan in order to make these muffins vegan). I added some wheat germ and chia seeds to up the nutritional content, and I used coconut oil instead of butter for added deliciousness to pair with the banana. And, of course, chocolate. Is there anything that chocolate doesn’t improve? I ended up with a muffin that doesn’t necessarily let the banana shine (because of everything else I put in there), but they are quite good and quite nutritious. Packed with Calcium, Fiber, Manganese, Potassium, Thiamin, Zinc, and Vitamins B6, C, E & K these muffins are not your run-of-the-mill junk-filled muffins. 2. In a large bowl, whisk together the flour, sugar, wheat germ, chai seeds, baking soda, cinnamon, and salt. 3. In a separate bowl, mix together the mashed bananas, coconut oil, vanilla extract, and almond extract. 4. Gently fold the wet ingredients into the dry ingredients until almost combined. 5. Fold in the sliced almonds, shredded coconut, and chopped chocolate. Mix until just combined. 6. Fill greased or paper-lined muffin cups about 2/3 of the way up with the muffin mixture. 7. Bake for 18-22 minutes, or until a toothpick inserted in the center comes out clean. These muffins sound fantastic! Can't wait to try them Daisy! Ha I'm not wasting any time or engery dipping them into syrup! Pour it right on! These were delicious french toast-y pancake-y all good breakfast foods! Nice muffins! Looking forward to meeting you at Camp Blogaway!